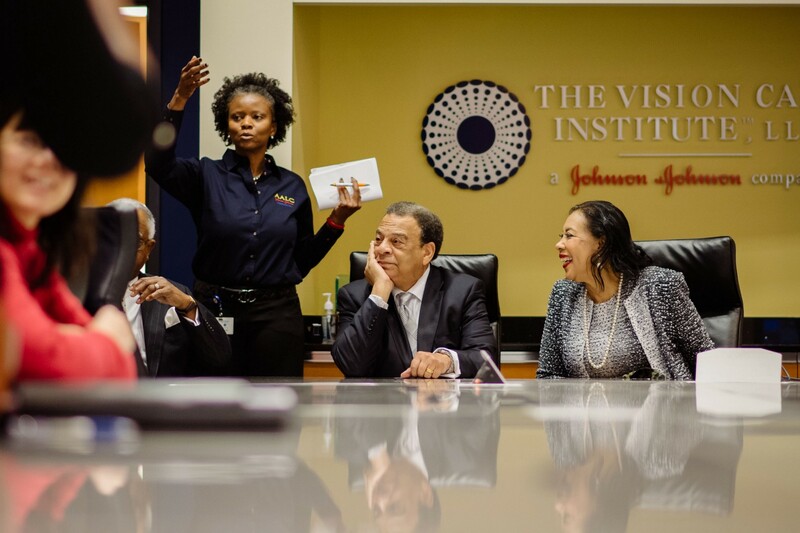 Lessons from Valerie Love, head of Human Resources for Johnson & Johnson Enterprise Functions. Angelina Darrisaw, Founder & CEO @CSuiteCoach, helping companies engage and retain diverse millennial talent. Getting more people of color & women promoted. Google Digital Coach. Valerie Love, currently the Head of Human Resources for Johnson & Johnson (J&J) Enterprise Functions, had just done the “big chop” when she was called in to interview for her first role at the company several years ago. She was nervous at first and received mixed reviews from her circle about how her hair would impact her professional growth. When she walked in the door to interview, her hair was complimented and embraced. “It was like a load lifted,” Valerie recalls, “knowing she wasn’t going to get distracted by my outward appearance, and wanted to know what I’m going to bring to this organization.” She was relieved to spend the interview chatting about how she would contribute, instead of worrying about how her hair would be perceived. J&J is currently shifting their approach to diversity to make sure there’s an equal focus on the inclusion piece, that often gets lost when companies talk D&I. In addition to tracking and improving diversity metrics to make sure the workforce reflects the population they serve, J&J launched an internal campaign called “You Belong” to encourage employees globally to bring their authentic selves to work. While the program launched in early 2017, the company had been working on it for over 18 months. J&J realized they were improving in their ability to attract and develop talent, but was still struggling with retention. Employee survey feedback and ERG feedback sessions validated the need for more emphasis on culture and inclusion. Love is very focused on data collection and measuring progress in these efforts. Part of the inclusion effort includes an investment in training. J&J recently partnered with Dr. Mahzarin Banaji, a Harvard professor and social psychologist, to roll out unconscious bias training for 100% of leaders (that manage employees). The global company initiative is at currently at 35%. The effort also includes partnering externally and more deeply with universities and organizations that source diverse talent. One such organization that has been a strategic partner is National Black MBA Association® (NBMBAA), where Love serves as a board member. The partnership helps provide tactics for a holistic approach to talent attraction, development and retention. The company has even changed how they engage in communities philanthropically, to ensure their employees feel more reflected in the company’s community efforts. J&J is also updating terminology on job descriptions to eliminate bias, after realizing dated descriptions were not attracting diverse talent. Finally, Love suggests a change in hiring for cultural fit, and instead focus on “culture add,” a term she heard at a local training. She emphasizes the need to not hire to fit a mold, but to hire with the mindset of how can this person add value to the culture overall. They review data quarterly to track growth in these areas. With all these different levers in place, J&J was recently recognized as #5 in The 2017 DiversityInc Top 50 Companies for Diversity, up from #8 in 2016. Still, Love insists J&J is not a leader in this space. “External validation is great, but we will be leaders in this space when our employees internally say we are. When employees can feel the needle moving that’s how we know the program is working,” stresses Love. Love champions D&I outside of her formal role as well, as a co-Executive Sponsor for JJVC African American Leadership Council, Executive Champion for JJVC Diversity & Inclusion Council, a Board Member for the Juvenile Diabetes Research Foundation North East Florida chapter, and as a Board Member for NBMBAA. She lives by the old adage “to whom much is given, much will be required.” Through her work, she mentors and grooms diverse talent to excel. Valerie Love, walking while working! With all the responsibilities she has on her plate, I had to ask her how she takes care of herself. “Lots of deep breaths!” She laughs. She insists on managing stress, because it can impact how you show up at work. “You have to have outlets, and something that keeps you whole outside of work.” One of her outlets is marathon running. She sometimes even runs while working! Finally, she says it’s important to spend your time where you are most passionate, because then your responsibilities don’t feel like obligations.